When I opened the newspaper one day this week, the front of the fluff section immediately had me. 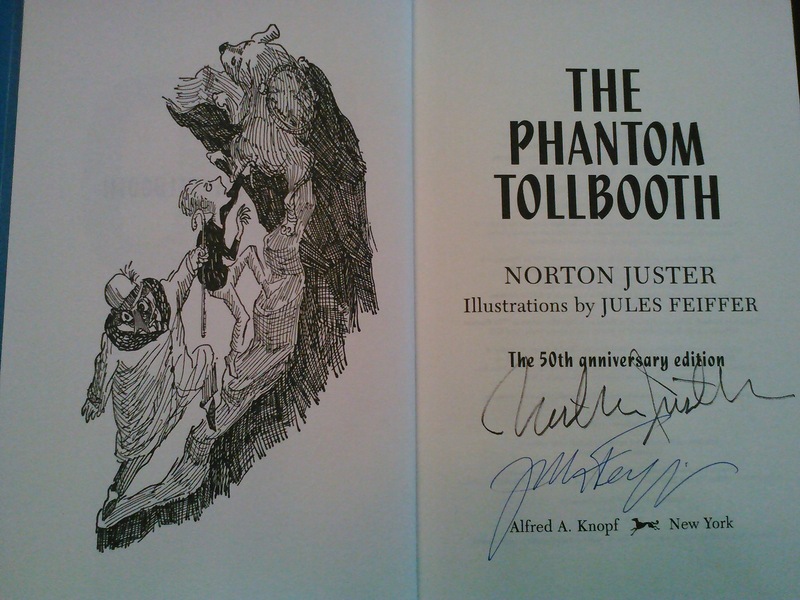 The author and the illustrator of The Phantom Tollbooth were coming to town. I needed to go. 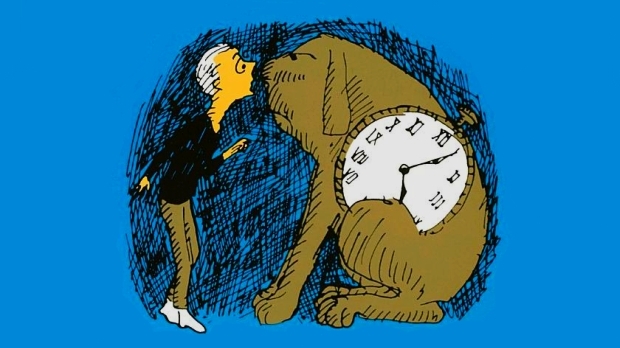 There is recent buzz about The Phantom Tollbooth since it is celebrating its 50th year. The book, like many wonderful children’s books, is a quest and adventure story. The main character, Milo travels through a mysteriously appearing tollbooth into strange lands inhabited by strange characters. He emerges from the tollbooth a new boy. Where he was once bored and unconnected, he becomes interested and ready. I haven’t read the book in many years, and it even occurred to me that this is not one that the kids and I read together. I am planning, however, to get back into it again. The event was delightful. On the stage of the lovely theater at the Jewish Community Center, the two eighty-plus-year-old gentlemen charmed the packed house. Norton Juster talked about how the book came out of avoiding writing a book about architecture that he had been awarded a grant to create. The adventures of Milo came to him during strolls on the beach. He would write each down and work on it until he was satisfied with it. Into each he would bring in the clever wordplay that his father had instilled in him as a boy. The finished episodes would be handed off to his neighbor and friend, Jules Feiffer who gave birth to the images of Milo, Tock and the land beyond the tollbooth. They bantered like longtime friends will do, and those of us in the audience smiled uncontrollably. We were watching a piece of our childhood come to life again. When the talking was over, the crowd moved out to the lobby. Many of us had new or old books clutched in our hands as we waited for signatures. We were like groupies waiting for the rock star to acknowledge us. But I titled this post The Phantom Tollbooth and marriage. The marriage part of this story is just as charming as the Misters Juster and Feiffer. When I saw that article in the paper, I sent it on to Dan. I asked if he wanted to spend our Saturday evening thusly. He responded with an enthusiastic, yes. Dan had not read the book as a kid, and he was not incredibly familiar with either man. He did, however, read my enthusiasm and got on board. That night, he waited in line with me prior to the doors being opened. He chatted with a cute couple behind us who brought along their copy of the book that was given to the husband of the couple by an old girlfriend almost 50 years before. We both got to unexpectedly see some old friends. And, after the talk was over, he happily waited in line to get autographs. That is what marriage is all about. We are not married because we are the same person. We are married because we have our differences and we make room in our own lives for those differences. When Dan wanted to go to a national conference of homebrewers a couple years ago, I did not know what to expect, but I was pretty sure that it would put him in hog heaven. Turns out, I had a great time too. It happens in our hobbies, the food we choose to cook, the restaurants we want to go to, the books we read, the organizations we belong to, the jokes that we like. Some we merely have patience for; others we learn to embrace. By the time we left the event, it was close to 10. Our plan was to eat after the talk, so we were kind of hungry. We arrived at a local mecca of restaurants and found that each finished serving at 10 – except for one bar. That bar was not what we planned. The restaurants that we had in mind would have been more interesting. The closing of restaurants at 10:00 seemed early for a weekend night. It was cold as we walked from place to place only to find the same story. But, it ended up that we got to sit in a warm place, filled with the happy sounds of people enjoying the success of their basketball team on the tv, drink a good beer, and eat some decent bar food. 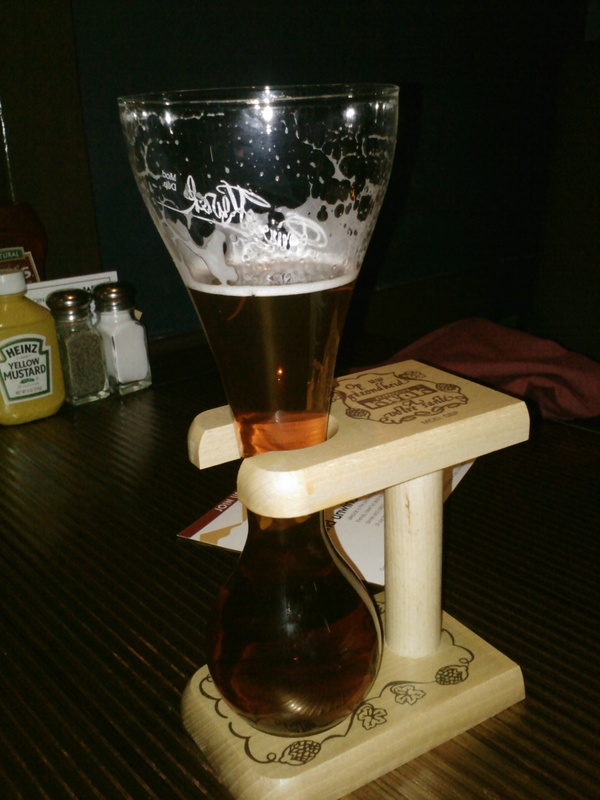 We laughed at the silly drinking apparatus his beer came in. We talked about the talk. We decided it was nice that the employees of the other restaurants had a reasonable schedule. It was a good way to close a very good night. Marriage is its own kind of tollbooth. Lucky for me, my traveling companion shares the journey well. Just kidding, that is a beautiful description of what makes a great marriage!